"I Deserve to Be Healthy"
Teresa McDill knew she was on a path to poor health. She saw how obesity had wreaked havoc on her family, leading to heart disease and diabetes. By age 30, she had spent more than half her life struggling with weight. "Every time I tried losing weight, I gained it back. I desperately wanted to be on a different path and realized most of what I feared was preventable," said McDill. In her third year of studying for her doctor of Osteopathy Medicine degree, McDill had problems with gallstones. With a prior history of deep vein thrombosis, she was worried about developing diabetes. She knew these symptoms would only progress unless she made a change. 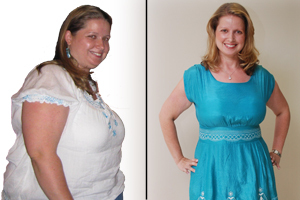 In June 2009, McDill began seriously thinking about weight loss surgery. She was beginning her third year clinical rotations at Bethesda Hospital East when she met her surgical rotation preceptor, Miguel Lopez-Viego, M.D., general and vascular surgeon, and Medical Director of the Bethesda Center for Surgical Weight Reduction. It was a unique opportunity to gain insight on the different surgical options, as well as the risks and benefits of weight loss surgery. "All the pieces were coming together. I finally decided that I deserved to be healthy," McDill recalls. "I decided to put myself first, only I was responsible for my health." "Preparing to Make a Change"
Teresa scheduled her sleeve gastrectomy for November 4, 2009, at the Bethesda Center for Surgical Weight Reduction. She weighed 240 pounds and wore a size 22. Going through nutritional counseling with a dietitian at Bethesda prior to surgery was part of her preparation. She had to understand why she was over eating, and learn to control her food addiction and ignore cravings. "Unlike other addictions, you can't give up food completely," she explained. "I had to change my whole attitude and learn to listen to the 'full' feeling and stop eating." "Working Hard for Good Health"
The hard work began following the surgery. McDill knew that in addition to changing her diet, she needed to make a commitment to a dedicated exercise program to lose weight permanently. She hired a personal trainer. "I knew building muscle tone would help with the weight loss, and help my body adjust at the same time." She advises others who are considering a trainer to find someone who is encouraging and really understands your goals. It's an important bond, so keep looking until you find the right person. For McDill, adjusting to life after surgery also came with emotional changes. Her body was changing, but her mind was the same. She had to learn to deal with old tendencies, and embrace new experiences. She joined the Post Surgical Weight Reduction Support Group at Bethesda. She found it helpful to talk to others. The group was a great place to learn new things or be introduced to different food options. She learned tips for handling plateau and finding motivation to keep going. "It provided accountability for my progress," McDill explained. "I recommend it for anyone who is considering weight loss surgery. It's important to know you're not alone." Ten months after her surgery, Teresa McDill was on the road to a healthier life. She is more confident, stands taller, and is more comfortable with her body. "I enjoy life a thousand times more. I feel healthier and stronger. I wish I had done it long ago."